Do you still use a Print or a PDF Catalogue? Whilst using a Print or a PDF Catalogue is a great idea, there are some drawbacks if you don’t have an online version of it that can be accessed from your website at any time. We can help you turn your Print or PDF catalogue into a stunning online version with real turn page effect. This means that your customers can view your catalogue without downloading anything and can read it like a book. Whenever you update your catalogue, all you have to do is update your file and everyone is looking at the latest version. The print catalogue doesn’t give you any visibility on Google. your PDF catalogue gives you a better visibility, However a flip catalogue will give you a lot of visibility for Search Engines such as Google, Bing and Yahoo. This way your visitors and customers can find your catalogue by just searching for it on Search Engines rather than having to go to your website and downloading it. All you need is a browser and internet. And everyone has that. The address of your catalogue will be similar to http://www.yourwebsite.com.au/catalogue and when you type that into your browser your visitors will be able to read your catalogue like a book. We can make your catalogue available on your visitors mobiles as well. Even on the iPhone, iPad and Android, your customers can read your catalogue like a book with a real page turn effect. You can also allow your visitors to download an executable file that opens up your catalogue so that they can use it when they want. This allows them to access your catalogue without any internet. Using this information you can not only provide your customers with a better catalogue but also more relevant content. Your customers can access the catalogue in full screen giving them better views of your catalogue as well as uninterrupted time to go through everything that they want to see. A table of contents which you can use to direct your visitors to the content they are interested in. So your customers can open the Table of Contents click on the products page, view the products, click on “how to order” get to the order page and get instructions on putting the order. We extract the data from your PDF catalogue and index all the text so that your customers can simply go into the catalogue and search for the product using a name. Interested in improving your catalogues? 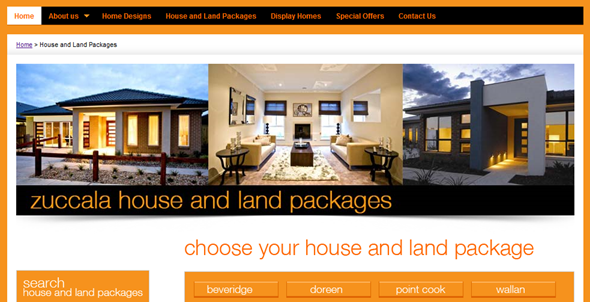 We are now finalising the Zuccala Homes website. Based on user feedback and customer feedback, we have implemented a lot of changes towards the newer version of the website. The navigation menu has been turned black, the search boxes orange and house and the Google maps from House and land packages has been removed because it wasn’t being used. A header image that will be the default on all the pages that don’t need flash interactivity has been used to freshen up the look and reflect on the main theme of the page. With most of the home builders websites, we realised that most of the websites were built in flash so was not accessible from the iPhone. Zuccala Homes Website has been built so that it is mobile friendly and can be accessed just as easily through an iPhone, Android or a Windows Mobile phone. 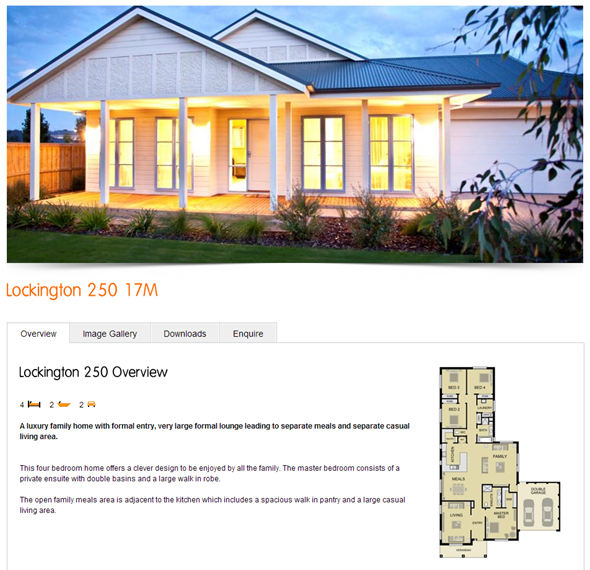 A custom CMS that runs behind the website is being built to allow Zuccala Homes to add new homes, house and land packages and display centres themselves. Next time we will discuss how the CMS works and how it was built. 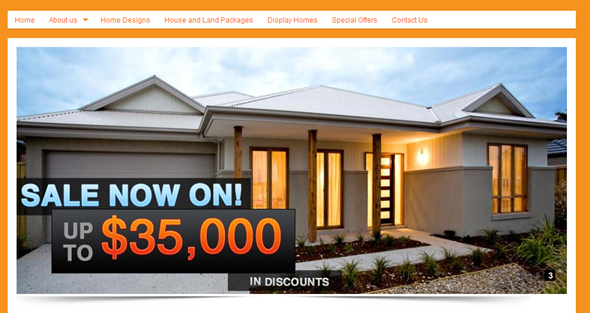 We are currently in process of building the website for Zuccala Homes, a home builder based out of Melbourne. The site is up live and now we are tweaking the website for Usability based on user experience and what visitors have done on the website so far. Here is the screenshot of the front page. 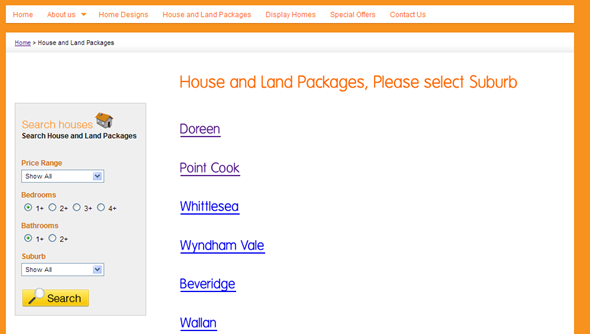 We just went live with the House and Land Packages section that displays all the current house and land packages available by suburb. While you can use the search functionality on the left hand side of the page, you can click on individual suburbs to view the current suburbs. So far we have tweaked the tabs, the search functionality, Enquiries to make sure that the user experience is better and works properly. When we started the website, there was also an issue with speed, that has now been fixed so that it loads quickly. Here are the new tabs that we are using. Web Analytics has been a core component of the whole website. It is very data driven and we are making changes to make sure that houses are easier to find, navigate, get information and enquire. The user experience on Zuccala Homes is crucial. We want to make it easy for a home-buyer to search for houses that they like and show them the house designs in the most detail with minimum clicks. Once they are satisfied with the home design they can either download a PDF to view more specifications or send an enquiry to Zuccala Homes. 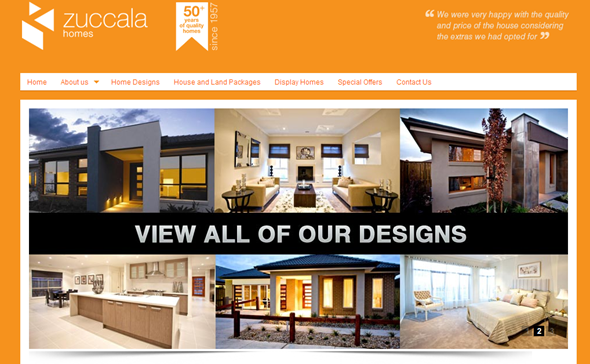 We have used the corporate colours of Zuccala Homes to build the website in their branding. Also a banner rotating on the front page lets the user go to different main areas of the Zuccala Homes Website. The home designs page allows a potential home buyer to search for any Zuccala Homes Design. A visitor can search through the Search Panel on the left or click on the individual home to get to the Zuccala Homes Design Page. 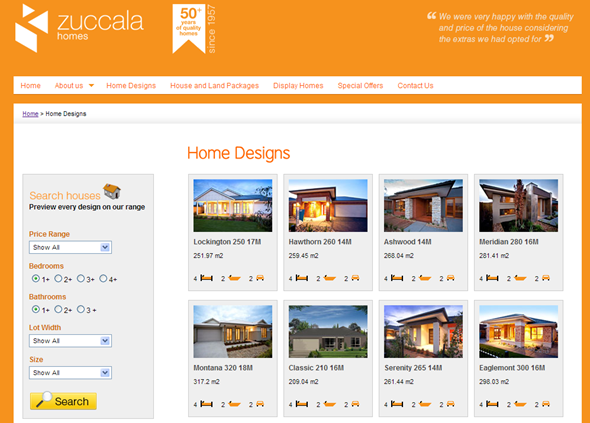 The individual Zuccala Homes Home Design Page allows a visitor to quickly view the Home Design of their choice. 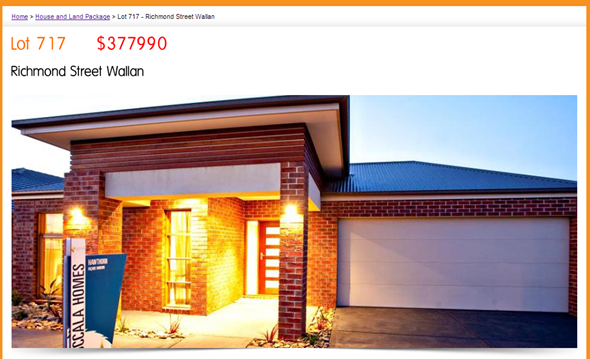 To give all the information of Zuccala Homes, information is put into different tabs where you can click and view more information, download PDF of the Zuccala Home or Enquire about that particular home. Please feel free to click on the links and view the website. We will be updating with more posts which details the user experience, usability, tracking and marketing of the Zuccala Homes website. I am sure by now everyone has heard of Google Instant and already used it. If you don’t know what Google Instant is (it has not been released for Google.com.au domain in Australia), please see the section below – Google Instant Australia for some explanation and a quick video. Google instant is a search enhancement that shows results as you type them. Google Instant is based around a key technical insight that people type slowly but read quickly so you can scan a page as you type. From a user experience and usability perspective, Google Instant is great. It’s not amazing but it does save those few seconds when you search. Google Instant can save upto 2-5 seconds per search, give you smarter predictions and more quick results. Personally I use search boxes on browsers rather than actual search engine, so it doesn’t make a huge difference for me. Google is not instant at Google.com.au domain 🙂 so if you are searching in Google Australia, chances are that you have not seen it.